Welcome to Part 2 of the FIRE small business series. Last time we talked about different types of entities and why you would want one. Just by setting up an S-Corp, we increased our take home pay (in our hypothetical situation) by ~30%. This assumes that you are paying yourself wages of all the income coming through your company. That’s great, but anyone in the FIRE community knows that you want to have some sort of tax advantaged retirement account to shove all this money into. I mean we have a company that’s paying us wages, so we need to put it into a retirement account! SIMPLE IRA – This is super easy to set up and cheap & easy to maintain. It’s set up to allow small businesses to set up retirement plans for their employees with minimal pain. The limits on this are annual employee contributions of $12,500 with employer matches of 3%, or mandatory employer contributions of 2%. SEP IRA – Again, fairly easy to maintain with minimal set up fees and costs and very limited paper work. The caveat here is that the employee can not contribute. You can have multiple employees, but the company must contribute evenly to every employee. The limits are 25% of income of the employee or $54k** (as of 2017). Solo 401(k) – More complicated to set up. There are a variety of paperwork filing requirements, namely the 5500, if your plan has more than $250k in assets. This is also limited to only the owner and their spouse. The limitations are the ones that we all know and love: $18,000** per person. The company can match up to 25% of the employee’s salary, up to a limit of $54k** total. Of these three, we narrowed it down to 2 very quickly. The SIMPLE IRA is great for folks that have employees (we didn’t) and want a cheap way to allow them to contribute on their own without having to match from the company. But, it’s a burden if you want to do your standard Backdoor Roth Conversions (we do), as it’s considered Tax Deferred money in your IRA portfolio, and therefore subjecting you to the pro-rata rule. Regardless, I wanted to max out the total amount that we could contribute and $12,500 just wasn’t going to cut it, so out with the SIMPLE IRA. I assumed we would max out our personal contributions and max out the corporate match on the 401k at 25%. This is assuming that you are paying all of your profit to yourself as wages. I also wasn’t sure how much money we would bring in. But, I knew it would only be us, so we wouldn’t have to contribute to anyone outside the family. What you can see is that if you are contributing the $18,000** and matching at 25%, you can tap out your 401k at ~$150k in income. Where with a SEP IRA you can only tap it out at ~$220K in income. You also can contribute a substantially larger sum to the 401k vs the SEP at lower income level. How does this compare to W-2 income with a 401k? Now that we have our company set up (an S-Corp), and we have a solo 401k. Let’s look at how the income breaks down. Same as before: $100k in income for both a W-2 Employee or a Self Employed S-Corp Owner. $40K in expenses that can be put entirely against the company. Employee Contribution of $18k for both situations. 100% of the pay from the S-Corp is coming as wages. The S-Corp will match 25% of the wages paid. The W-2 Employee gets a 5% match for their contributions. So where does this shake out? Even though the W-2 employee technically took in $5,000 more top line money ($100k + $5k 401k Match) the Business Owner took home almost the same amount ($23k vs $22k). The Business Owner put more into their 401k ($29k vs $23k). Even though $5k of the W-2 was free money from the employer. In total the Business Owner takes home ~$5,000 more between take home pay and 401k contributions. The Business Owner comes out way ahead in tax payments, simply because their expenses and company matches of the 401k are not taxed at all and $18k of their income is only subject to payroll tax ($8k vs $19k). We’re starting to see how powerful owning a business is for retirement savings. Let’s compare this to our company from last time. The same default ($100k income & $40K deductible expenses) but with no 401k. So, by opening the 401k and having your company match 25% you end up keeping ~$5,500 more dollars. Not Bad!! Well, we went with the solo 401k. I set it up through Fidelity. It was actually pretty painless to set up. Once into the office to sign some stuff, and the recurring stop ins to drop off checks… URGH! We couldn’t do a Mega BackDoor Roth because these things are straight off the shelf, and they are standardized for everyone. Most people aren’t interested in anything even remotely close to that stuff. They didn’t even know what I meant when I asked about over contributing to it. I actually managed to get some after tax money in there by accident, OOPS! We did this for almost 2 years. Once we wanted to employ someone outside of our family, this wasn’t going to cut it any more. It worked great, we were able to put away a bunch of money through it. What if there was a way that we could cut down on taxes even more? What if we could “avoid” the pay roll & self employment taxes? We’ll see about that next time! Mrs. Adventure Rich recently posted…Be Mine: A DIY Valentine! I’m hoping this helps explain some of the basics of stuff that we learned by going through this. The Solo 401k gets a little bit of a bad wrap for the set up and fees, but Fidelity actually was super easy to set up, and there were no fees. So, once you have your EIN number, I would make sure you set that up immediately. It really is a great way to keep more of your money in your pocket. If you end up with more specific questions just let me know! I’ll give you my best shot. Never thought about this and glad to always learn something new! Thanks.for teaching. Wow, little ole me teaching a doctor something… I’m honored! Hope it helps and I hope it’s good knowledge to keep in mind as you venture into side businesses or your own practice. I want to be able to take advantage of these but I have to first have a profitable small business!!! Yeah. That’s a good place to start. Just remember that profitable is a weird thing… your payroll is considered an expense, so you can still pay yourself and be unprofitable. It’s all a shell game. And a really weird one at that. Very interesting. I’ve read that the solo 401K is also a good vehicle for 1099/independent contractor earnings. It could be a good fit for bloggers and writers. You are exactly right! A LLC or sole proprietor can execute this as well. And it is super powerful. The key is what we will discuss next time which is using draws to avoid the self employment and payroll taxes, which you can only do through an S-Corp, or an LLC taxed as an S-Corp.
Really liking this series! Learning more and more about small business tax and retirement strategies. keep it up! Great to hear! It took me a bit of pain and trial & error to find this stuff out. That’s why I’m hopeful it will help others going forward. Glad to hear you’re enjoying them. I really do hope it’s enough info that it gives you an idea of questions to ask and where to look. This stuff is so complicated that you can’t possibly spell out every situation. I just wish I had something that spelled it out for me in a simple way so I could understand where to even start looking. Here’s to paying it forward with karma! And good luck! I hope this is all helpful. This is great! Very eye-opening to see how you can optimize taxes as a self-employed person. Thanks for taking the time to write this up! It was surprisingly eye opening for me too the deeper I got into it. You can save a substantial amount more than otherwise thought. Even better. We are both employees. So not only are we avoiding taxes on the one contribution, the take home pay in the example becomes the 401k contribution to the spouse. Therefore reducing it even more. I’m doing taxes now and it’s not fun. Last year I made $65k. Contributed $30k to the i401k. Self employment tax was $10k. I’m not bringing home much after taxes. The SE tax really bites once you start making more income. It certainly does. That’s why you can look into the S-Corp which allows the distributions, which then avoids the Self employment tax. I’m not 100% sure how it works with a sole proprietor, but your matches to the 401k on your salary should be tax free, as they are considered an expense of the company. So, hopefully you’re matching 25% of the payment to yourself. Again, not really sure how that would flow through, since in a SP the entire business profit is subject to SE tax and Income Tax. Is there anything else you can push expense wise against the SP? Hopefully that would reduce your tax burden a little more. From what I understand, the self employment tax is applied to 100% of the sole proprietor. The 401k contribution doesn’t deduct against SE tax. Thanks for your input on the other question too. So, for a S-Corp you can have the company match, so 25% of the wages you pay yourself are not subject to either SE tax, or income tax. You can avoid the income tax on your personal contributions and then avoid all of it, SE tax & income on the company contributions. Then you can also optimize the distributions, so that you don’t have SE tax on those distributions, as well. Again, I’d run it buy a professional, but I think this is where it’s advantageous to have a corporation vs a sole proprietorship. I’ve been all about that Solo 401k ever since I discovered it. A lot of people doing sharing economy/gig economy stuff don’t realize that they’re technically running their own small business, which makes them eligible to create a self-employed retirement plan. 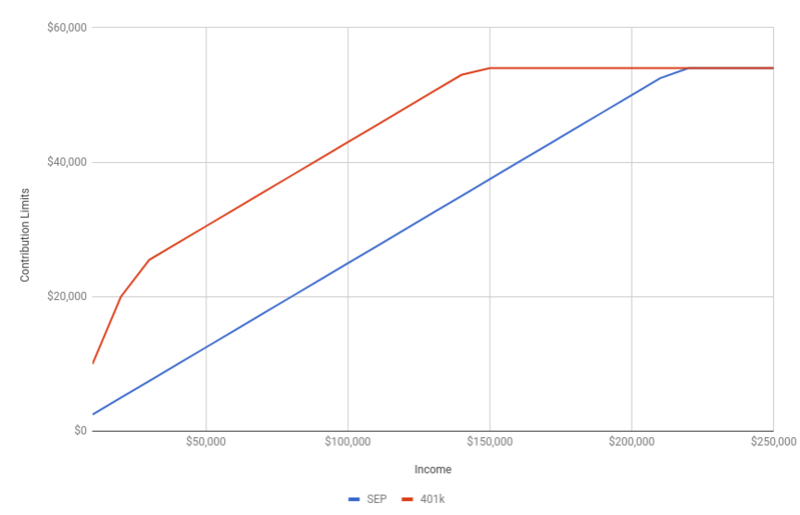 The way I see it, if you earn some extra income on the side, you basically get to have another retirement account that other people don’t get to have. Like you, I set up my solo 401k with Fidelity and put all of my sole prop earnings into it (my sharing economy gigs basically make me a business of me). Simple enough to do, and no fees. Plus, you can invest in Fidelity Index Funds which are even lower cost than Vanguard funds. The beauty of competition is that it drives down costs, which benefits us! Yup, we went through Fidelity as well. Looked at vanguard but their product wasn’t nearly as good. The solo 401k is definitely a huge benefit, especially if you don’t need all of the side income. You can really sock away the bucks in there if you do it right. Another option is a defined benefit/profit sharing. The administration costs aren’t cheap but it can allow a business owner to save hundreds of thousands on top of a 401k depending on ones income. I own a business (C corp) in CA and taxes here are ridiculous so i’m sheltering as much as possible so that when i retire (hopefully in another state) i won’t have to pay 8-13% CA state tax as well as SE tax. Thanks for the heads up. That’s a good idea and I’ll definitely have to look into that some. CA certainly does have it’s grubby hands in everyone’s cookie jar. Gotta fight them off little by little. Hey there, thanks for posting this. I too, am a business owner and came to the same conclusion about the solo 401k and I also have it with Fidelity. The dropping off the check thing was driving me nuts and I finally talked to a retirement specialist at Fidelity who told me the trick to work the system so I wouldn’t have to physically drop off checks: do a monthly (or whenever, but I like monthly) bill pay from your checking account to your 401k, then a week or two later (so that the money is in the account), set up an automatic monthly investment from the 401k into the funds you want. Saved me a bunch of time and I hope it does for you as well. That seems like a good alternative. I just made a point to go down there once every so often and take care of it. I also made sure to complain everytime. But it’s really not that huge of a deal. Glad to see you are getting in on the investing as much as you can. These solo 401k’s really help!